Modern Testing Principles created by Alan Page and Brent Jensen are the natural evolution of the Agile Tester. With these seven principles of Modern Testing, testers can start moving from being the owners of quality to being the ambassadors of shippable quality, delivering value, and improving the quality culture of the team. Let’s begin our journey into Modern Testing by reviewing each principle. These are highlights of what principles could mean for testers and testing, and the companies that engage testers that use Modern Testing Principles. ONE - Our priority is improving the business. Testers on agile teams are often seen as the cost centre. A good test mind applied to a feature team is a value-add, not a cost. Modern testers add value to teams. Value is often represented in dollars and the bottom line. They are data-driven and customer-obsessed. They are passionate about efficiency and want to speed up the release process and provide value faster to the customer. TWO - We accelerate the team, and use models like Lean Thinking and the Theory of Constraints to help identify, prioritize and mitigate bottlenecks from the system. Testers do less testing. Drive more quality. Developers do more testing. Testers teach and coach developers to write the smaller tests. Testers take on the larger initiatives around testing. Pairing experiences over solo work allow teams to find more in the code and bake quality in faster. THREE - We are a force for continuous improvement, helping the team adapt and optimize in order to succeed, rather than providing a safety net to catch failures. With a gradual transition of moving the more code intensive testing to developers, and having testers coach and lead testing efforts, quality improves across team projects. Testers are no longer considered the last line of defence but the first line of offence safeguarding customer retention and adoption of applications. FOUR - We care deeply about the quality culture of our team, and we coach, lead and nurture the team towards a more mature quality culture. Creating a community instead of isolated testers is important in growing a mature quality culture. Collaborative and innovative, members of the community develop empathy with other members and grow projects and ideas out of that collaboration. They share knowledge and expertise in the community network allowing members to openly ask for assistance rather than remain in isolation with issues that could be plaguing their work. FIVE - We believe that the customer is the only one capable to judge and evaluate the quality of our product. Customer input is absolutely important to modern testing practices. Either collecting customer feedback or collecting data directly or indirectly from the customer, allows teams to best determine how the customer is responding to a feature. This can determine the course of development for any project or company focused on serving the customer and the bottom line. SIX - We use data extensively to deeply understand customer usage and then close the gaps between product hypotheses and business impact. Data is the key to Modern Testing. Without data, you are guesstimating what the customer is doing and what they actually prefer. Delivering features which no one wants to use or are forced to use do not provide the customer value in the long term. It’s imperative to have good data. To understand and craft the data being collected and to balance the importance of collecting data and using the data. Data can close the gaps between product hypotheses and business impact by creating a constant and predictive feedback loop of information up which teams can act on. SEVEN - We expand testing abilities and knowhow across the team; understanding that this may reduce (or eliminate) the need for a dedicated testing specialist. “Do I need to quit my job and become a developer?” No, focus on the mission. Evolve into using tools and gaining knowledge to better help the business. Specializing Generalists know a lot about a lot of things. Lead the culture of quality. Look for improvements. Be open to learning and change. Keep The Modern Testing Principles In Mind And To Hand! 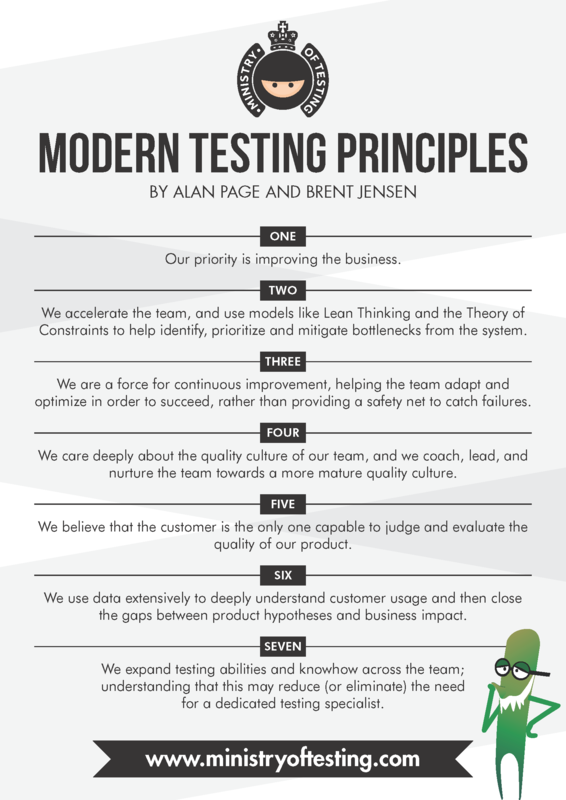 Here is a glorious graphic of Alan and Brent’s Modern Testing Principles and you can download a PDF version below to download, print and share! You can also hear more about the Modern Testing Principles in Alan’s TestBash Brighton Talk, his Testing AMA on Modern Testing and read the latest on the Modern Testing Principles in Alan’s blog.